The goings-on go on and on. I can't stop any of it, even when I sit very, very still and watch Battlestar Galactica. Case in point: fermentation. I've been keeping the maple vinegar in a secret location where the cats can't get at it. 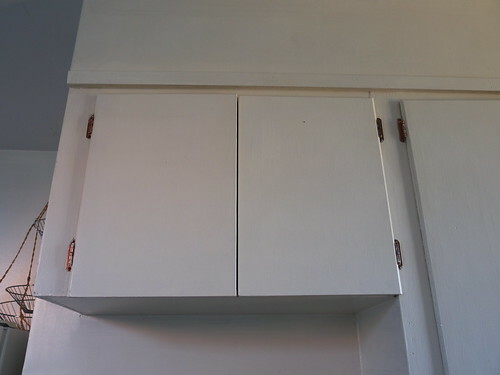 The secret location is the cupboard above the dishwasher. If you come over, that's where the vinegar does its dark work. Just to be clear, the vinegar's inaccessibility to the cats is dependent on the height of the location, not its secrecy. It's not like the cats could benefit from knowing where it is. They don't have much follow through, if you take my meaning. If you open the cupboard, you will spy the maturing vinegar. 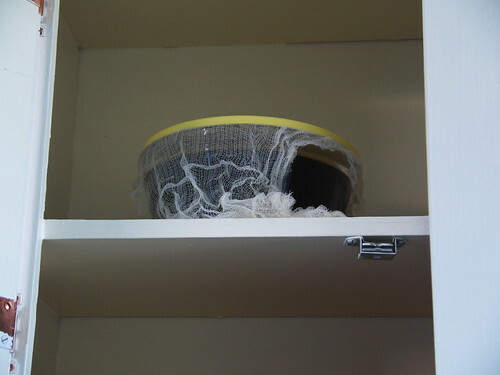 You'll also note the cheesecloth trailing out from under the lid. Cheesecloth is the mark of adulthood. Adults are the kind of people who know to drape a cheesecloth over a bowl of maple syrup, rum and vinegar. If you didn't see the cheesecloth in this photo, you would be within your rights to phone Vinegar Services and have them come to remove the vinegar from my care. But before you do that, check that you don't suffer from cheesecloth blindness. It's a rare condition, but very real and very tragic. Thousands of Americans are unable to see cheesecloth. Usually it results in very frustrating trips to the grocery store. Today the Humpty's Family Restaurant marquee read "Come Try The Tangler Burger." This is not appetizing. I picture strands of meat tangling themselves in your intestines. And I don't picture your intestines very often. In a recent poll of Internet users around the world, a startling 25 per cent believe that Jessica Alba, well known for her stunning looks, would be even hotter with a can opener for a foot. Mr. Rhames then banged his can of ravioli against the kitchen counter in a gesture that professed his love for Ms. Alba. Or maybe for ravioli from a can. I think that's all for today. More updates as the situation develops.